Our family orders 4 medium shakes and our total is only $7.21! We ordered large shakes one time and they lasted us for two desserts! As much as we all love ice cream, they were just too big for us to finish! 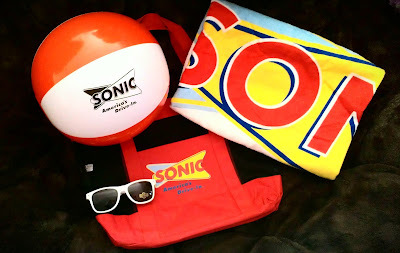 Disclaimer: I received a complimentary Sonic Summer Beach Essentials Prize Pack for the purpose of writing a review and hosting a giveaway. Regardless, I only recommend products or services I use personally and/or believe will be a good fit for my readers. The views and opinions expressed on this blog are purely my own. Results may vary. No monetary compensation was received. I know it might sound boring but I love Vanilla so I would go for the Vanilla Shake sounds so so good to me. The best way to enjoy grapes is to freeze them and they are cold and taste sweet and good on a hot summer day. they have so many great flavors. I would love to try the Strawberry Cheesecake flavor first! I would like to have the peanut butter cookie shake. We just went to Sonic the other day and the kids had shakes but I didn't. I regret that! My favorite summer time treats are Cherry Italian ices. I haven't had a real Italian ice in ages. Wow, what a great variety of flavors to choose from! I'd most like to try the Peanut Butter Banana Shake! Looks delicious! 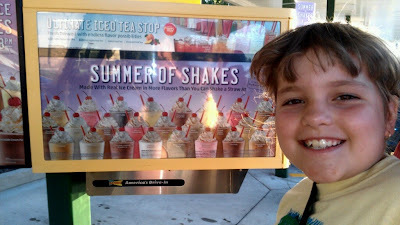 Actually, the Sonic Blasts are my favorite summertime treat. I really enjoy the Snickers Blast! My favorite is hot fudge sundaes with extra hot fudge..yummy! I want to try the Peanut Butter shake. But so many of the shakes sound good to me! I would most like to try the chocolate covered strawberry. I might need to take my son for a special first day of school treat to try these new shakes! My favorite summer time treat of all time is iced lemon tea. So refreshing and healthy. My favorite summer treat of all time is ice cold watermelon on a hot day. I think I'd like to try the Peanut Butter Fudge milk shake. Sounds delicious. My favorite is a route 44 cherry coke from sonic during happy hour! good ol fashioned Strawberry for me. We love to go to sonic! I especially love their diet cherry limeades! I would like to try their hot fudge shake! Me favorite summertime treat is sliced watermelon! Its so juicy and sweet...perfect for cooling you down in the heat! I would love to try the Strawberry Cheesecake Shake. I sounds delicious. I usually just order a chocolate shake. I always get the Chocolate Cream Pie shake but maybe I should branch out and do the Hot Fudge one. My treat? I love s'mores (and not just in the summer!)!! Give me a gooey marshmallow, melty chocolate and graham crackers -- and I'm a happy girl. I would really like to try the peanut butter fudge shake. There is nothing not to like! This is going to sound weird but my favorite summer time treat of all time actually has to do w/all the yummy fresh produce from my garden. I love tomato sandwiches!! Toasted bread w/a little mayo and sliced tomatoes sprinkled w/a little salt and pepper. Yummy! Peanut butter fudge would be my choice. So glad to find several Sonics near our home in Vegas. My husband would go every day. The oreo cheesecake shake sounds sinfully delicious! I am a fan of anything cheesecake! Yum Yum! The Cherry Cheesecake sounds amazing! They have so many more milkshakes more than just vanilla or chocolate! I would like to try the cheesecake flavored milkshake. I love cheesecake and think this would taste delicous. The Oreo Cheesecake Shake looks yummy! I love their Mocha Java Chiller so I'm sure these shakes will be awesome too!!! I love their cherry milkshakes! There are no sonic's close to us, so we would love to use this and take a drive for a special treat! I really want to try the cheesecake milkshake. I know it's going to be so good, I'll probably have something new to crave. My favorite summer treat is diet sprite with watermelon ice cubes. I just freeze chinks of watermelon and fill a glass with them and pour Diet Sprite over them. It's really good. I would like to try the peanut butter fudge milkshake. It sounds really good. I would choose the peanut butter fudge milkshake. Sounds like a reese's dream! We love sonic at our house, YUMMY!! I've only had food from sonic a few times in my life. They have some pretty good hotdogs, coming from the woman that didn't want one. The Strawberry Cheesecake flavored shake. I would try the peanut butter and jelly shake because it is a new twist on a classic treat and is a food and drink all in one! I want to try the peanut butter chocolate. The hot fudge shake sounds awesome. I would like to try that one for sure. I would like to try the coconut cream pie. It looks very yummy and good for me. I love sonic's shakes. my favorite is just regular chocolate tho! I guess im a chocolate addict!! the other flavors are good too but i feel guilty if i dont get chocolate! my favorite summer treat is a banana split!! they are so tasty!! i love the bananas and chocolate! my favorite summertime treat is definitely ice cream. ice cream cone, ice cream sundae, milkshake, it's all good! I would most like to try the chocolate covered strawberry. I would most like to try the chocolate covered strawberry shake, but I will probably order my old standby banana shake. My favorite summer treat is watermelon, it may seem boring but there is no denying how delicious it is and it helps to keep you hydrated. I'd love to try the Peanut Butter Fudge shake, I had no idea they had so many flavors. Peanut Butter & Bacon? Yikes, my husband might like that one LOL! I love their strawberry and banana shake (boring, I know). However, I just saw that they had a peanut butter and bacon shake! Might have to give that a whirl next time we eat there. I love Chocolate Covered Strawberries, so that's the shake I'd love to try! Thank you! I guess I'd have to say my favorite summer treat is watermelon! I eat it all summer long. The best Sonic Shake that I always love to drink is the Chocolate Shake. Sonic makes the best shakes and they are half price after 8pm. Milkshakes are my favorite summertime drink! That is a really tough question. What is my favorite summer time treat of all time? It would have to be Watermelon because it is so healthy to eat and it tastes yummy! should be. All mixed up. 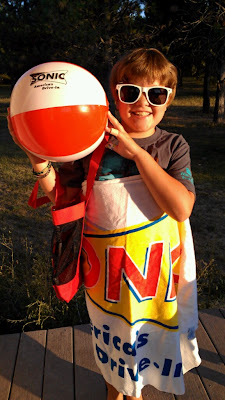 Tell me in a comment your favorite summer time treat of all time! I love Sonic and am so happy they brought back the Peanut Butter Fudge Shake. It's my favorite! That is a tough decision to make, but I would probably try the peanut butter banana shake! I would like to try the Strawberry Cheesecake Shake. I would like to try the coconut cream pie. I'd love to try the Oreo Cheesecake. Uusually I get Sonic Blasts, so I've never tried their shakes - looks like I'm missing out! Definitely Vanilla. I never get chocolate ice cream or shakes. Vanilla is just a classic flavor that can not be beat. anything peanut butter! but i'll go with peanut butter cookie, since those are two of my favorite foods! I would like to try the hot fudge milkshake at Sonic. Anything with chocolate is good to me. Peanut butter fudge sounds awesome! peanut butter bacon shake for me. sounds yummy! The milkshake that I would like to try the most at Sonic would be the Cherry Cheesecake one. 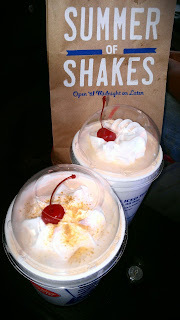 I love Sonic milkshakes and the one I love to get the most often is the strawberry cheesecake milkshake. Well, we all love Ice Cream floats made with real vanilla ice cream and Birch Beer or Root Beer soda. I like chocolate shakes, so I'd like to try the Hot Fudge. My favorite summer time treat is ice cold lemonade. I especially like flavored lemonades, like strawberry. my favorite summer time treat of all time is yogurtland frozen yogurt with mochi, rainbow sprinkles, and graham cracker crumbles. When I had gotten my wisdom teeth taken out this past June, my mom took me to Sonic to get a shake. I kept begging for a "Strawberry Coconut" shake, which is just a strawberry cream pie shake without graham crackers in it. I'd really love to have one of those! I really want to try the Peanut Butter Fudge at the Tacoma Sonic! I would most like to try the Cherry Cheesecake shake. They had a really great shake around Valentine's Day that was soooooo good. Think it was the Sweetheart shake if I'm not mistaken.